Then today I get an email from New York Magazine (written by Faran Alexis Krentcil*) for these molds. Anyway, the recipe is for making frozen Rhubarb Yogurt with Raspberry Syrup Pops. 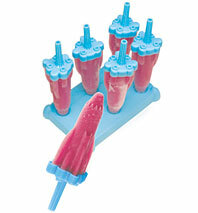 Personally, I like to make them in Push-Up Pop form, but these molds will work just as well. The recipe can be found here. They make an excellent treat and are pretty simple to make. Though remember they are frozen pops- think ahead, make them today so you can enjoy them tomorrow. Oh, also, with this recipe I recommend reading it straight through before starting, personally I cut back a bit on the sugar in both the rhubarb and the yogurt, it gives the frozen pop a nice tangy flavor. P.S.- Faran, I don’t recommend trying to make Frozen Daiquiri’s in spaceship form. Due to rum’s low freezing point you are just going to get slush, no frozen spaceships, well, unless you leave the rum out, but really what is the point then?